The formula of a successful gift? The special experience lived by the one receiving it. Outmatching the gift of a simple material object in favor of an experiential activity, Smartbox has reached undisputed leader sales figures: approximately 6,5 million gift boxes each year in 10 European countries. 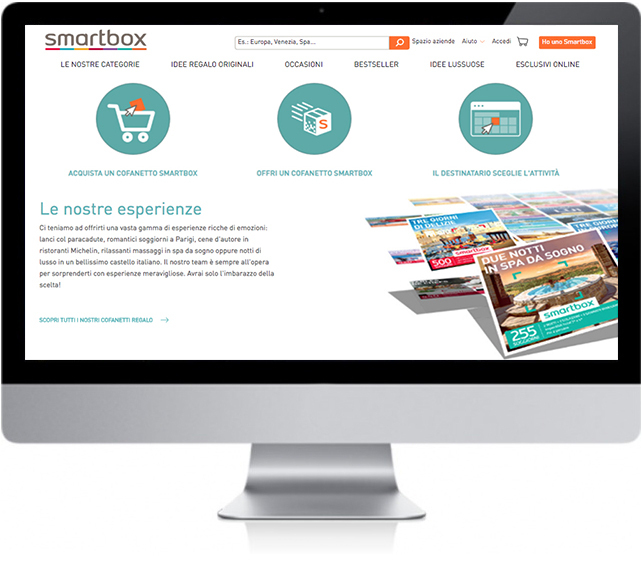 The collaboration with reMedia starts in 2016, when Smartbox Group acquires Wish Days, adding Emozione3 to its portfolio. We actively participate in activities related to information migration from one digital system to another. An assignment that also represented a stepping stone to a later opportunity to collaborate with the leading Group in “gifting emotions”. In fact, a project is currently under way that could potentially allow the integration of 100+ Channel Managers with the Booking system, with a dual goal: facilitate the management of availability, tariffs and bookings of gift boxes for all touristic accommodation establishments; multiply the types of Smartboxes available, by engaging new partners.